If you were expecting some kind of sun sign nonsense, forget about it. This is real astrology for the real world, not some mystical mumbo-jumbo word salad. If it's real astrology for yourself that you want, you can get it by phone or in print. And if you need help deciphering the astrological glyphs in the graphics accompanying this article, see Astroglyphs: Astrological Symbols Guide. Please note: this forecast is expressed in terms of Universal Time (UT, aka GMT). All mundane asrology charts are calculated for the location of the Great Pyramid at Giza. This is a purely arbitrary choice, and is as good as any other location in tlhat respect. (Better than most even, if only because it has been around for thousands of years.) Also please be aware that, while I never change a forecast once it's published, I do post errata to acknowledge typographical errors and the like. PLEASE NOTE: This is a free (and greatly abbreviated) version of my 2018 World Forecast Highlights). If you’d like your own copy of the full 2018 Forecast Highlights (41 pages, illustrated), it’s available in hard copy by mail ($75), or as a PDF document by email ($50). Orders may be phoned in (toll-free from anywhere in North America to 800-527-8761, and charged to any major credit or debit card. PayPal orders may be placed direct from your own PayPal account page to rnolle@astropro.com – or by using the astropro PayPal order page. -- The butterfly counts not months but moments, and has time enough. With its five eclipses (three of them SuperMoons) and five SuperMoons (two of them full, and three the lesser known Stealth SuperMoon type), 2018 is well stocked with notable Sun-Moon alignments, timing the arrival of powerful cosmic tides rippling through Earth’s atmosphere, seas and crust, accompanied by strong storms and seismic events. There are other storms too; the distinctly human kind that time upheaval both individual and collective, from personal ups and downs to the ebb and flow of financial fortune and the winds of war. These too have their celestial signals. This year, they include Mars Max, the biennial close approach of the Red Planet to Earth: a major timer of all manner of conflict, including war. There’s a reason the ancients knew Mars as a war god . . .
And then there’s Mercury Max, which makes its customary three passes this year. Is there a reason Murphy’s Law breaks out all over during this cycle, when Mercury draws near to our home planet; and if we know when it’s coming, can we avoid some of the typical Mercury Max mishaps? The answer, in both cases, is yes. All of the above-mentioned 2018 cycles are notable but fairly common, if not clearly understood in traditional astrology. But this year also brings a most peculiar celestial event, making its first appearance in this century. It’s the first one since 1996 in fact. And there won’t be another until 2087. What is it? Nothing; that is, a complete absence - a kind of a hole in local space/time. After more than twenty years of continuous historic currents roiling all around us and carrying the world forward in a headlong rush into destiny, this year there’s a temporary partial disconnect. The mighty River of Time flows onward as always of course. But for now, we’re temporarily suspended in an isolated whorl, set apart from the main flow in a way that we haven’t experienced in decades. (There were only four such years in the entire 20th Century, and there will be a total of only three in the 21st.) Let’s see how it all unfolds, starting with Mars Max. We can look back to see what Mars Max has ushered into history, and look ahead to see when it will come again. But the best place to start is to look into the night sky, because you won’t find Mars Max in astrology books and references. That’s because, like SuperMoon (a concept I defined and named on the pages of Dell Horoscope back in 1979), Mars Max is a new kind of astrology. Like SuperMoon, it’s a concept with deep roots in ancient astrology; but it has been lost down through the ages, as astrology turned away from the night sky and into books and tradition. I call it Mars Max because it’s a cycle anchored by the Red Planet’s close approach to our home planet. Astronomers call this close approach to Earth perigee, and it is the key to both Mars Max and SuperMoon. Any planet in perigee appears abnormally big and bright in the sky – like a full moon SuperMoon, for example. You can see this for yourself with the two full SuperMoons of January, at the beginning and end of the month. In both cases, the Moon will be in perigee, and will look larger and brighter than usual when it rises full in the eastern sky at sunset. It’s the same with Mars Max. Look up in the sky to find the Red Planet during a Mars Max cycle – and particularly around the time of its peak, the Sun-Mars opposition that defines the Mars perigee – and you’ll see Mars burning bigger and brighter than usual - roughly eight times bigger and brighter than it does when farthest from Earth. This increased Mars prominence in our sky coincides with an amplified presence of all things martial in human experience. (As above, so below.) This isn’t to say that humans are gentle lambs the rest of the time – far from it, as is clear from history and literature. But it is to say that, when the red orb of Ares burns brightly in the sky during the Mars Max cycle, everything martial is amplified in us. The 9/11 attack, the German invasion of Poland that started World War II, Pearl Harbor: they’re all obvious Mars Max manifestations. Warfare is integral to the astrology of Mars, which is why Roman mythology dubbed Mars the god of war. But war is only one end of the Mars spectrum of violence, which ranges all the way from the individual to the collective, from interpersonal squabbles to mass murder to terrorism to all-out warfare. Consider Columbine a case in point: the archetypal 1999 high school massacre took place within days of the April 24 peak of the 1999 Mars Max. Wars, terrorism and crime are intentional mayhem, by definition. A rising tide of anger and belligerence accompanies the growing prominence of the Red Planet in the sky during Mars Max. But unintentional mayhem also surges, with people becoming more irritable, careless and impatient as Mars grows bigger and brighter in the night sky. So an increase in accidents also accompanies this cycle; along with a surfeit of fires and explosions, whether natural or human caused. Take, for example, the May 2016 Fort McMurray wildfire known as "The Beast", which roared through Alberta and into the history books as Canada’s worst natural disaster ever – right in the middle of a Mars Max. Or the April 20, 2010 explosion and sinking of the Deepwater Horizon drilling rig in the Gulf of Mexico, the largest accidental marine oil spill in history: Mars Max again. Between its start at the waxing Sun-Mars square, through its peak at the Sun-Mars opposition, and its end at the waning Sun-Mars square, there is a seemingly paradoxical quality buried in the Mars Max cycle; namely, that its peak occurs while Mars is retrograde – i.e., apparently moving backwards through the sky. Of course this is apparent motion only. Mars – or anything else in space – will never go backwards in its orbit. This seeming reversal is only what it looks like to us, as our Home Planet catches up and passes Mars. It’s like passing another car on the highway. The car may whizz by as it passes us. But if we accelerate, we catch up on it, and as we do its motion relative to us gradually slows – until, if we maintain sufficient speed, we pass the car and it begins to move backwards until it fades in the rearview mirror. AlthougThe 2018 Mars Max begins with the Sun’s waxing square to Mars at 4 degrees Capricorn on March 24. The retrograde station of Mars takes place on June 26, at 9 degrees Aquarius (opposing President Trump’s natal Pluto). Mars at 4 Aquarius makes its perigee (close approach to Earth) on July 26, opposing the Sun at 4 Leo. The Red Planet’s retrograde ends on August 27 at 29 Capricorn (opposing Trump’s natal Venus). And the Mars Max cycle as a whole ends on December 2, with the Sun-Mars square from 11 Sagittarius to 11 Pisces. If any of these happen to be important degrees in your own natal chart, pay attention: be cool, be calm, be focused – and then watch the maelstrom unfold around you. The big picture here is that Mars spends the 2018 Max cycle between 4 Capricorn and 11 Pisces. This range, and the specific degrees and dates mentioned above, outline the high points of the 2018 Mars Max. Mark those dates in red on your calendar (give or take a few days or so) as focal points for the “fires, crashes, clashes and explosions” factor. To them must be added April 2 (Mars Max conjunct Saturn in the sky above, and opposing Mercury in Donald Trump’s birth chart), the last week of April (Mars Max conjunct Pluto in the heavens, opposing Saturn in Trump’s natal chart); mid-May (Mars Max opposing Trump’s natal Venus), early August and mid-September (Mars Max square Uranus), late July (the lunar eclipse conjunct Mars Max), and mid-November (Mars Max square Jupiter). 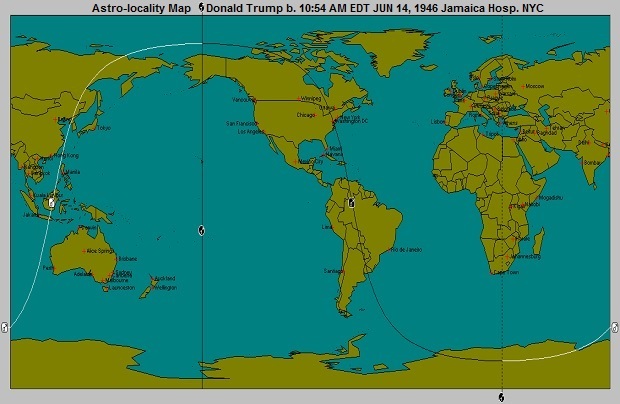 I mention President Trump’s chart here not only because it takes direct hits from this year’s Mars Max, but also because it has been so heavily aspected ever since the August 9, 2017 solar eclipse, which fell on his natal Mars at the ascendant while Saturn was at the same time sitting on his natal lunar eclipse; also because the February 15, 2018 total solar eclipse reactivates his natal Mars-ascendant alignment. Now that Mars Max is also drawing a bead on the President’s chart, he becomes more beleaguered by the day. As I pointed out in my August 2017 online forecast, the solar eclipse that month has ominous connotations for the President. (The eclipses of 1974 and 1998 had impeachment connections for Presidents Nixon and Clinton.) As I put it in that forecast, "Is impeachment in Mr. Trump’s future too, under the same eclipse that brought Mr. Clinton to that impasse? Or will it be a 25th Amendment removal from office? Or something else? There are a lot of possibilities here; none of which bodes well for Mr. Trump." Astrology goes back to a time when rulers didn’t leave office for constitutional reasons, so there are less genteel possibilities in the picture here. Of interest to me, with regard to these Mars transits and the eclipses activating Trump’s natal Mars, is that his BC data yields an astro-locality map featuring a Mars horizon line that arcs through Washington DC and Pyongyang, North Korea. Mars, the planet of war, connecting these two points at the moment of Trump’s birth is ominous, both literally and figuratively. (For more on astro-locality mapping, see the Astro-Locality section at the end of this forecast.) So much Mars activation, at so many levels, raises the specter that Mr. Trump is surrounded by danger, which threatens not only him but also the world at large – particularly during the Mars Max cycles of 2018 and 2020, if he manages to stay in office that long. I don’t expect he will. The greatest Mars Max threat comes after his time in office: late 2019 and on and off throughout 2020, when at one time or another we’ll see Saturn conjunct Pluto – or within a few degrees of each other, plus Mars Max and Mercury Max. Unfortunately, given that war and peace hang in the balance over Korea even in the best of times lately, rash action can easily spin out of control. We can be sure that the infamous Trump petulance will raise its ugly head around eclipse time. The fact that Mr. Trump’s natal Mars horizon line arcs from Washington DC across North Korea is noteworthy. Born under Mars rising, Mr. Trump is widely known for his belligerence, for going on the offensive when he feels threatened, for bullying his way through adversity. Those lifelong traits are especially dangerous now that he is Commander in Chief – and particularly under all these Mars Max contacts to his natal chart. This brief excerpt just scratches the surface, as far as 2018 is concerned. For the full, in-depth story, I refer you to the complete copy of my 2018 World Forecast Highlights. It’s 41 pages (8-1/2 x 11) in length, with color illustrations of the year’s major celestial configurations and corresponding astro-locality maps. Hard copy reports are available by mail ($75); PDF copies are available by email. Orders may be placed by phone (toll-free in North America), or by mail: see below for the number and address. Payment by major credit and debit cards (American Express, Discover, MasterCard and Visa) or by check or money order works fine. PayPal orders may be placed direct from your own PayPal account page to rnolle@astropro.com – or by using the astropro PayPal order page.